The imposing building on the right is a 70,000 square foot mosque with 10-storey tall minarets. Where is this building located? 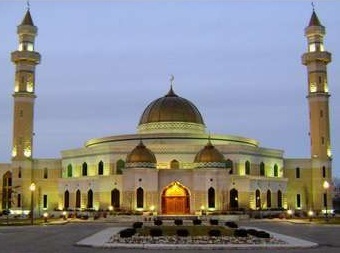 This massive mosque is located not in Saudi Arabia or Iran, but in Dearborn, Michigan in the United States of America. And it isn't alone. In both size and number, mosque building is accelerating across America (80% of the mosques in America were built in the past 14 years - see Islamization of America), as well as in UK and Europe. Who is financing the mosque building in the West? Much of the money for building mosques, Islamic schools and other Muslim assets in the West comes from the Muslim nations in the Middle East. For example, from 2011 to 2013, Saudi Arabia sent to India alone some 25,000 Muslim clerics and over $250 million to build mosques and universities and hold seminars. * And from 2013 to 2016, the government of Turkey put up $100 million to build the largest mosque in America, in Lanham, Maryland. Where do they get their money for building mosques in the West? They get their money from oil exports. In 2008, for example, the United States sent $386 billion overseas to import 4.7 billion barrels of oil, including from the oil-rich Muslim nations. In 2008, Saudi Arabia alone raked in $256 billion from oil exports, and a bulk of that money then was funneled back out to the West via groups like the Muslim Brotherhood's North American Islamic Trust (NAIT) to build and own Islamic assets. In other words, every time people in countries that import oil from Saudi Arabia and other oil exporting Muslim nations put gas in their cars, they are giving money to Muslim Brotherhood or other Jihad groups to advance Islam (see Spread of Islam). In recent years, the rise of fracking and the production of shale gas and oil have stemmed the tide of money flowing from the United States to Saudi Arabia, but the demand for oil from the rest of the world, including China, will keep Saudi Arabia and the other oil-rich Muslim nations flush with cash for decades to come.